Both US antitrust agencies marked the third quarter of 2018 with significant policy announcements regarding the merger review process. The announced reforms seek to expedite the review process through cooperation between the agencies and the merging parties. Moving first, the Federal Trade Commission (FTC) revealed a Model Timing Agreement that provides the FTC Staff with earlier notice of the parties’ intent to substantially comply with a Second Request. Earlier notice allows the FTC Staff to create a more effective timeline for meetings with division management, front office staff and the Commissioners. Less than two months after the FTC revealed its Model Timing Agreement, the Antitrust Division of the US Department of Justice (DOJ) announced procedural reforms aimed at resolving merger investigations within six months of filing. The DOJ will commit to fewer custodians and depositions in exchange for the merging parties providing key information earlier in the investigation. Overall, these reforms appear to be a positive step forward for parties considering future transactions, but their effectiveness remains uncertain as the agencies start a difficult implementation period. While the FTC timing agreement may provide more certainty around the process, it does not reduce the review timing and actually extends it. The European Commission (EC) remained quite active clearing mergers in the third quarter of 2018. 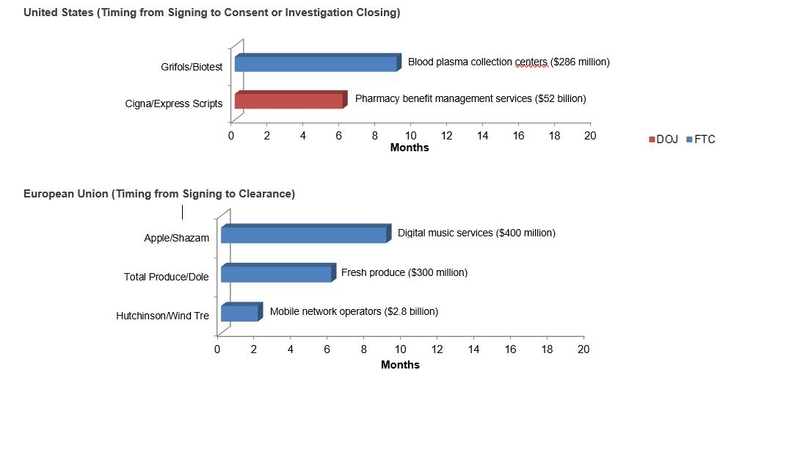 Most notably, the EC cleared Apple’s acquisition of Shazam without imposing conditions despite the EC’s stated concerns about access to data as a competitive concern. The EC opened a Phase II investigation into the transaction to investigate the potential for Apple to obtain a competitive advantage over competing music streaming services by accessing Shazam’s consumer data obtained through its music recognition services. In this case, the EC did not find evidence that the access to Shazam’s data would provide Apple a competitive advantage. In addition, the EC found that there were no concerns about Apple potentially restricting Shazam as referral source for Apple’s competitors. Going forward, it is clear that access to data is an issue that the EC will continue to investigate, but it is also clear that the EC is taking a careful approach in assessing when that access will truly lead to a competitive harm. On August 7, the FTC published a new Model Timing Agreement with the goal to “streamline [the] merger review process in order to reach swifter resolutions.” The FTC expects to use the Model Timing Agreement in all transactions that receive a Second Request. One of the main provisions requires parties to agree that they will not close their transaction until 60 to 90 days following certification of substantial compliance with the Second Request, depending on the complexity of the case. This period is longer than the 30 days required by statute and is designed to provide staff sufficient time to review the materials provided. FTC Chairman Joseph Simons announced in June that the FTC would host a series of multi-day, multi-part public hearings titled Hearings on Competition and Consumer Protection in the 21st Century. The series of hearings considered whether broad-based changes in the economy, evolving business practices, new technologies, and international developments warrant adjustments to competition and consumer protection law, enforcement priorities and policy. The hearings commenced in September and covered a review of the competition and consumer protection landscape, concentration and competitiveness in the US economy, privacy regulation, the consumer welfare standard in antitrust, vertical mergers, conduct by platform businesses, the state of US antitrust law, and mergers and monopsony or buyer power. The hearings continue on November 6–7, and 13–14. Maureen Ohlhausen left the FTC as of September 25, though she continues to await confirmation by the Senate to a judicial position on the US Court of Federal Claims. Christine Wilson has been sworn in to the FTC to a term that expires September 25, 2025. Wilson was Chief of Staff to former FTC Chairman Tim Muris and a senior vice president for regulatory and international affairs at Delta Air Lines, Inc.
At Georgetown Law’s annual global antitrust enforcement symposium on September 25, Assistant Attorney General Makan Delrahim announced that the DOJ is seeking to resolve most merger reviews within six months of filing. The announcement came in response to concerns that the agency takes too long to review transactions. The DOJ will accomplish this task by meeting earlier with companies and key executives, and narrowing the scope of Second Requests to lessen the burden on both sides. At the same symposium, FTC Chairman Joseph Simons announced that the FTC plans to conduct case studies to examine both expeditious and lengthy reviews to understand the problems before changing the FTC’s approach. The FTC will also begin a new merger data collection program to compile data on the length of merger reviews at the FTC. On July 9, the Austrian and German competition authorities published guidelines on the application and interpretation of the new “transaction value” and the “local nexus” merger control thresholds introduced in Germany and Austria in 2017. These additional merger control thresholds were introduced to capture deals in the digital and health care markets, in particular where the target has no or limited turnover but may still be an important/influential player on the market. Under the new thresholds, a transaction is notifiable where the transaction exceeds a certain value and the target company has significant activities in the domestic market. In Austria the value of the transaction must exceed 200 million euros; in Germany it must exceed 400 million euros. These thresholds supplement the established turnover thresholds.